What Has Happened to “Substitutionary Atonement?" Roger Olson: Why is it that, during my lifetime, evangelical Christianity in America seems to have largely forgotten and possibly even discarded the theme of substitutionary atonement? Read more about What Has Happened to “Substitutionary Atonement?" The importance of the subject is obvious. The Atonement is Christianity in epitome. It is the heart of Christianity as a system; it is the distinguishing mark of the Christian religion. For Christianity is more than a revelation; it is more than an ethic. Christianity is uniquely a religion of redemption. At the outset we take the ground that no one can clearly apprehend this great theme who is not prepared to take Scripture as it stands, and to treat it as the final and authoritative source of Christian knowledge, and the test of every theological theory. Any statement of the atonement, to satisfy completely the truly intelligent Christian, must not antagonize any of the Biblical viewpoints. And further; to approach fairly the subject, one must receive with a certain degree of reservation the somewhat exaggerated representations of what some modern writers conceive to be the views of orthodoxy. We cannot deduce Scriptural views of the atonement from non-Biblical conceptions of the Person of Christ; and the ideas that Christ died because God was insulted and must punish somebody, or that the atonement was the propitiation of an angry Monarch-God who let off the rogue while He tortured the innocent, and such like travesties of the truth, are simply the misrepresentations of that revamped Socinianism, which is so widely leavening the theology of many of the outstanding thought-leaders of today in German, British, and American theology. 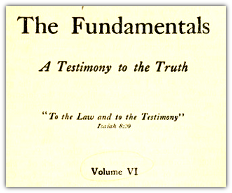 Founders Blog: "The objectivity of the atonement guards against a faulty synergistic idea of salvation. That is, when we realize that Christ has actually done all the work, we remove the possibility of joining our own works in the mix." To compare the doctrine of definite atonement with the contrasting view of the Arminians, Lorraine Boettner observes, “For the Calvinist, it is like a narrow bridge that goes all the way across the stream; for the Arminian, it is like a great wide bridge that goes only half-way across.” The question is not whether the atonement is limited in some sense, but how.